This is a very dry post today, which may just be a reflection of my mood… Sorry about this, but this appears to be a “facts only” kind of day. As part of an AIA group, I was able to visit the Interfaith Peace Chapel at the Cathedral of Hope in Dallas. In the mid 1990’s, the church commissioned Philip Johnson to design a master plan for heir expansion. By about 2001, a bell tower was built, which was designed by Johnson’s office. 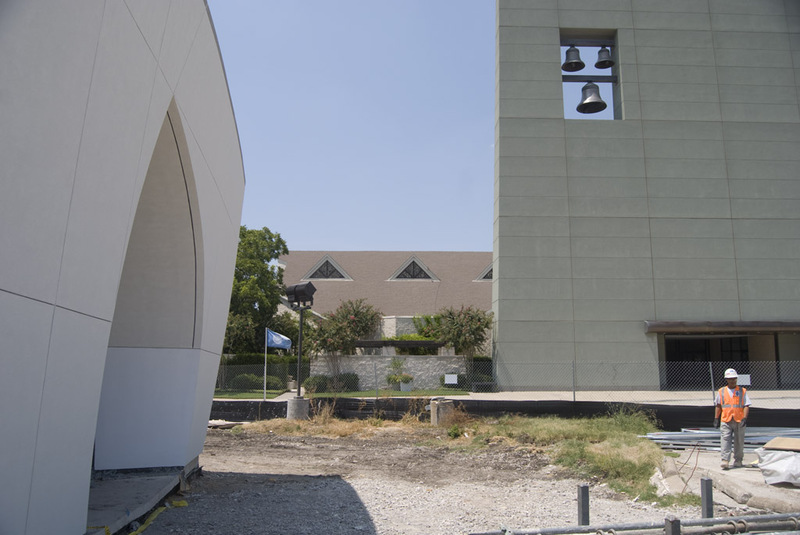 The Interfaith Peace Chapel was given the green light after Johnson had passed on, and was picked up by local architect Gary Cunningham. They built construction documents by using a digitized version of the model originally built for the master plan. It seems like a rather challenging task, as the interior and exterior skins take different forms. Belltower separating the existing sactuary from the new chapel. Eventally an outer cloister will tie all of the structures together, including the future sanctuary. 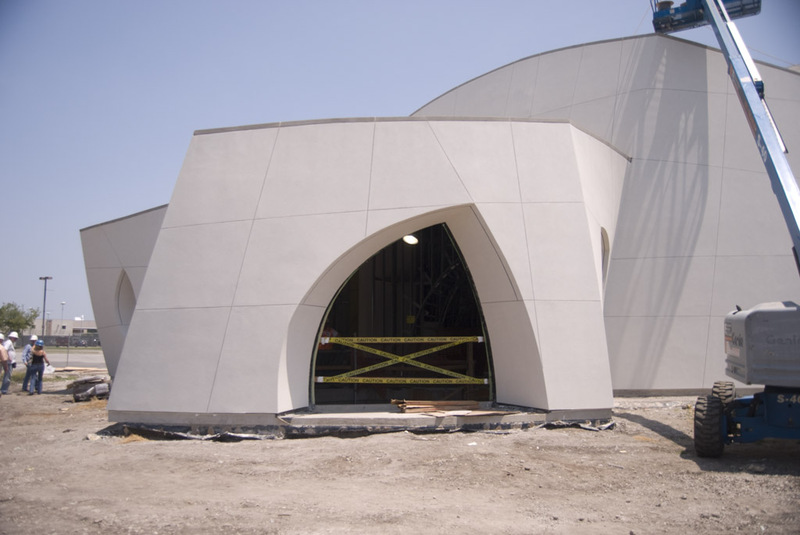 The different forms do allow for massive amounts of insulation, which is required for a chapel which sits directly under the flight path of Love Field. 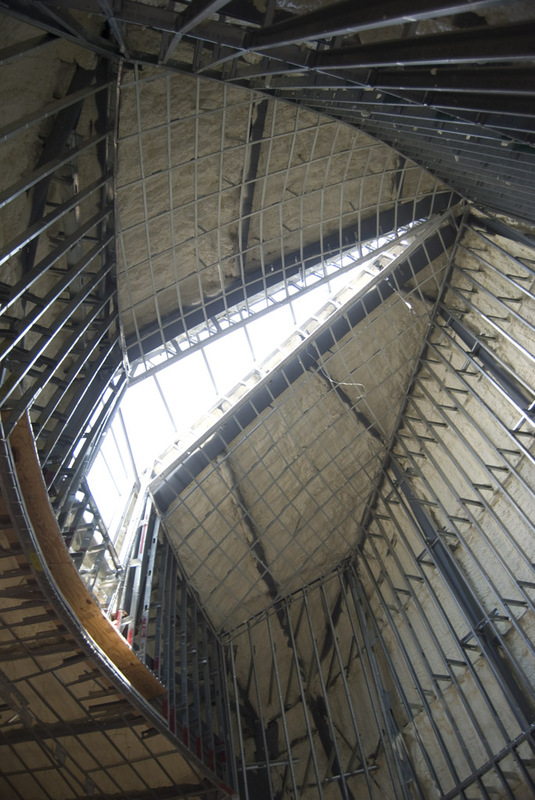 The roof, which will appear to be monolithic with the rest of the skin when complete, is two layers of concrete sandwiching a layer of insulation. The only acoustical weak spot will be the skylight, but it is glazed with over an inch (1 11/32, if I remember correctly) of tripled glazed laminated glass. Skylight and spray applied open cell insulation throughout. Each stud was premanufactured and numbered for assembly. 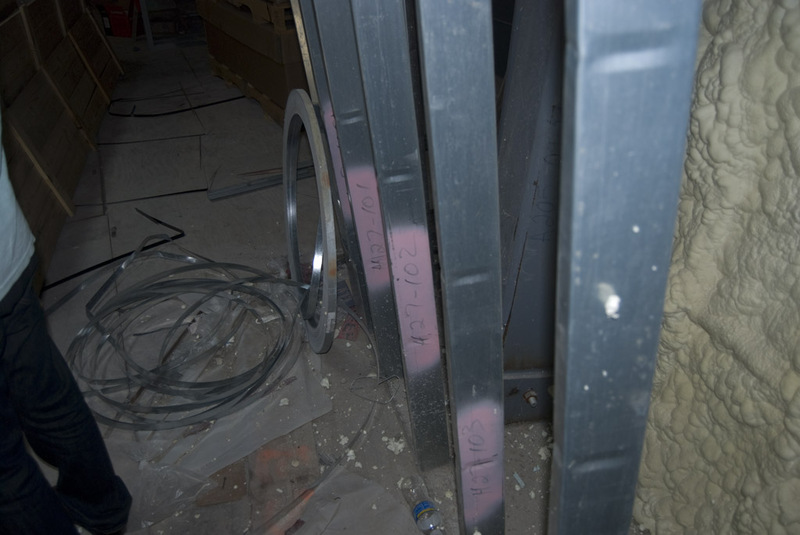 Since all of the walls have a unique complex curve, each stud was individually crimped to meet specifications. The chapel holds about 200 people, but the next phase, a sanctuary, will be designed to hold roughly 2,500 people. Below is a very nice animation of the project produced by M2 Studio.